The dining room is often one of the most elaborate rooms in a home because it is used to host meals with friends and family. Some families use their dining room every night as the family dinner table and others reserve their dining room table for special gatherings or occasions. Regardless of how often you use your dining room furniture, you should be aware of the best ways to take care of it. Dining room furniture is quite expensive and like all wood furniture, it is vulnerable to minor damage without the right type of care. 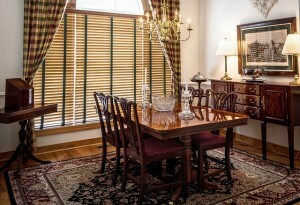 The following tips can help you maintain your dining room furniture to get years of use. Dust may seem harmless but it can actually be damaging to wood furniture like dining room tables. Dust leaves tiny scratches on the surface of wood furniture because it is abrasive and enough dust buildup can even wear out the finish and affect the appearance of the furniture. This makes it important to dust your dining room furniture regularly, even if you don’t think it needs dusting. Make sure you dust the surfaces of the table and chairs, including the legs and crevices, with a dust cloth or mitt to effectively capture the dust and debris. Do not use feather dusters or wet dust wipes because they can each cause more damage to the table. Minor surface damage can happen at any time when using the dining room furniture. It is important to catch this type of damage quickly or it could get worse. Check the surface for scratches, gouges, cracks in the finish, and water rings and make sure you inspect the padding and upholstery for any tears or other damage. You should check your dining room furniture often for this type of damage to address any problems before they become worse. All wood furniture including dining room tables and chairs are vulnerable to scratches. Anything from dust to dishes and even course placemats can scratch the wood, making it important to protect your table with proper placemats and pads. Tablecloths and placemats made from cotton or linen effectively protect your table from scratches and they are safe for the wood. Place cork or felt pads under heavy items such as candle holders or flower pots and replace these pads often for effective protection. You should cover your table with a tablecloth between uses. Moisture can cause considerable damage to wood furniture whether it’s from a spill, condensation, or even humidity. You must clean up any spills immediately to prevent damage and make sure to use coasters to prevent water rings. If you put hot plates or pots on the table, use hot pads to protect the wood and finish. Despite your best efforts to protect your dining room furniture, it may still experience damage or lose its finish to regular wear and tear. If your dining room tables and chairs have sustained any type of damage, call a furniture restoration expert to inspect and repair the damage. These professionals provide complete wood furniture repair and restoration services that also include applying new finishes. With these tips and the help of furniture restoration experts, you can preserve the beauty of your dining room furniture and continue to impress your guests and family.